Clear skies, warmer weather, and sunny days are back. It can be hard to resist the siren’s call to go outside and explore but if you prefer to stick closer to home, you can still find ways to enjoy nature from the comfort of your backyard. 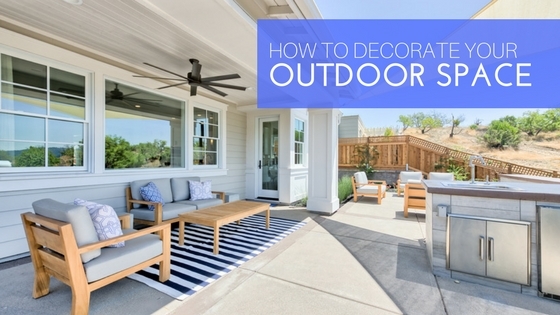 These tips on creating a smart and stylish outdoor living space will help you to create the perfect space where you’ll want to spend as much time as possible enjoying the warm weather. Because your furniture will be left outside to the elements, make sure you invest in quality outdoor furniture that is meant to be outside. Look for weatherproof furniture that can withstand the elements, including direct sunlight, without peeling, fading or rotting. If you opt for wood or metal, make sure to use a waterproof coating to help protect your furniture. Don’t forget to make sure the furniture it comfortable as well! Today’s outdoor seating options have improved and can now be just as comfortable as your living room couch. Before you being placing furniture, take a step back and consider what the natural flow of traffic. You want to make sure you have plenty of open space near the main entry and enough space around your furniture so people can easy walk around. Well-designed indoor rooms typically build off one element — a sofa or piece of art, for example — which gives the eye something to land on; the rest of the furnishings and accents support that piece. That same principle applies to outdoor living spaces. Here, an extensive pond becomes the central gathering point, providing a spot to arrange furniture and orient views. We hope these tips help you to create the perfect outdoor living space you’ll want to spend all your free time at home.